This is a commission I did for a magazine called Private Air, distributed to private jet owners. Kind of a lifestyle magazine for the conspicuously wealthy. Anyway, they have a monthly feature where they ask architect, designers & artists of note to come up with their vision of the private jet of the future. Mine is not so far off thanks to Burt Rutan and other pioneers of private space travel. This is designed for sub-orbital intercontinental jaunts at hypersonic speeds, thanks to the exotic scram-jet derived engines. 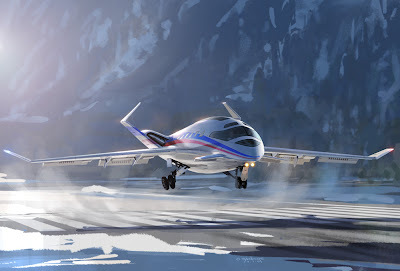 The scene shows it landing using its vectored-thrust STOL capabilities at a private strip somewhere near Aspen. Or is it Chamonix? Could be anywhere. You can find the article in the current issue, or online HERE.